I thought it would be more fun to do and I really enjoy myself along the way. I did a few pages and wrote some quotes that I like for inspiration. Anyway, the last day of September, I thought more about it and this would challenge me by doing art journals once day for a year. I got inspire by someone who does art everyday even if she don’t feel like it or not in the mood and someone who did a art journal pages for a year. I thought there a challenge I can see myself doing. I have to say that life always seem to get in your way when you have a dream and you feel like give up on it but this time, this time I going to do it. 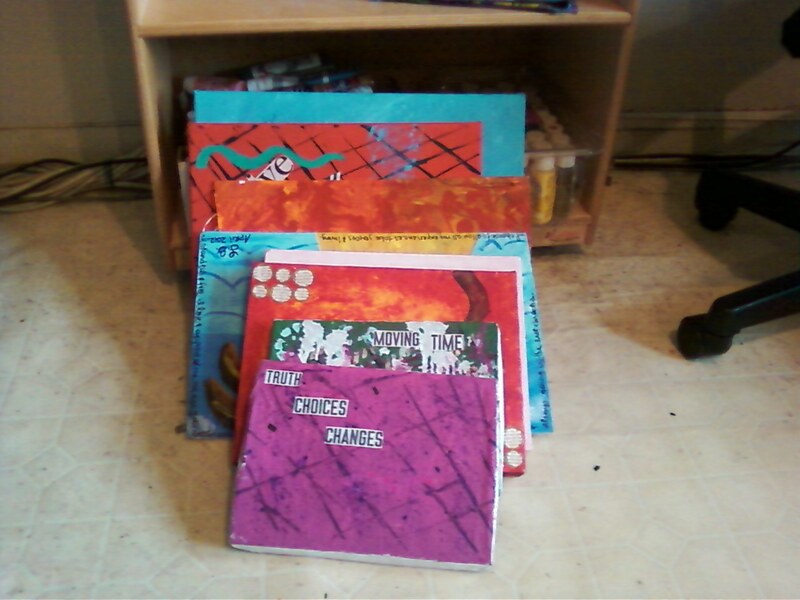 The challenge is I have old notebooks that I can use to make the art journals. 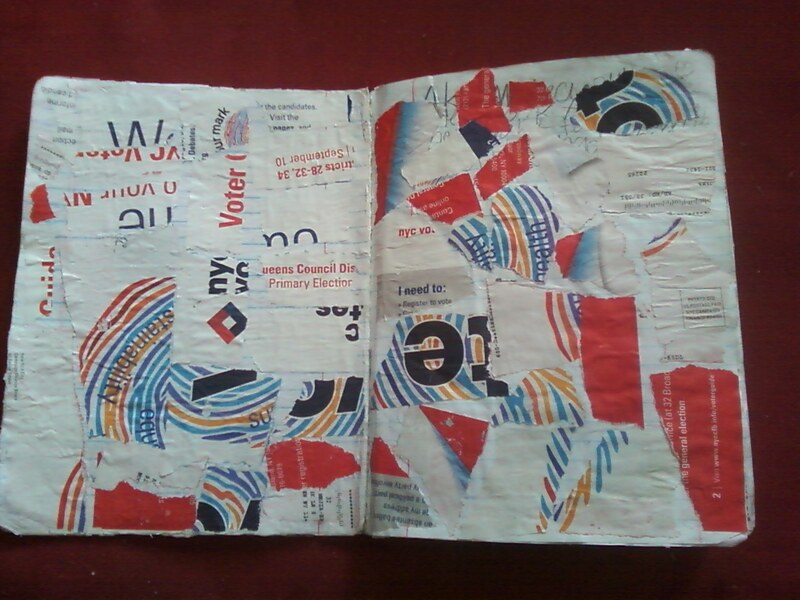 I would use four pages in which two will be glue together to make the pages thick and this will absorb the paint easily. Then two pages will be enough room to do a piece. I can do anything on them and if I want I can write a quote or whatever I am feeling at that moment. I will post them here so you can see my process and how much I have grown. I’m really excite about this and can’t wait to get started. 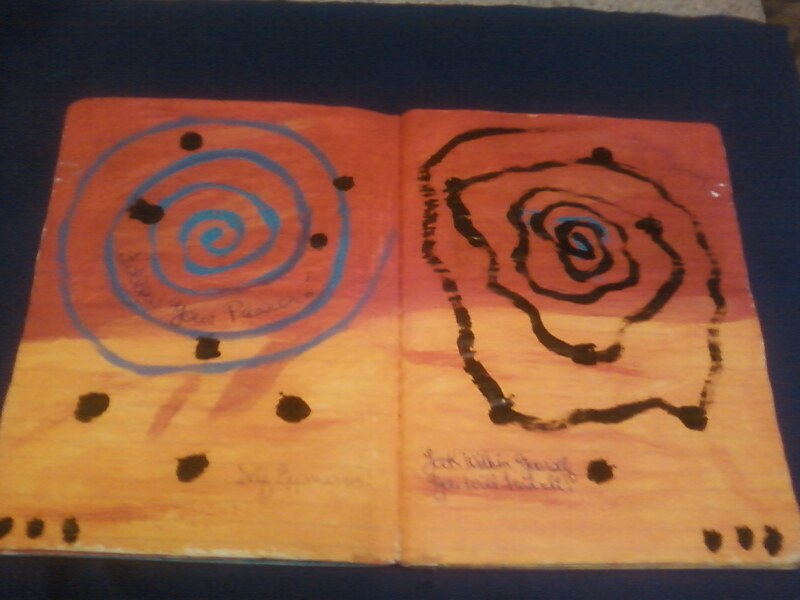 I’m going to post the 7 days once a week for your viewing pleasure and the following week another 7 days of the art journal entries. I’m getting ideas already on what I want to do. Wish me luck that I don’t stop and keep going on this challenge. I love a challenge that I enjoy doing and having fun along the way. I just grab the colors bright pink, dark purple and lite pink. 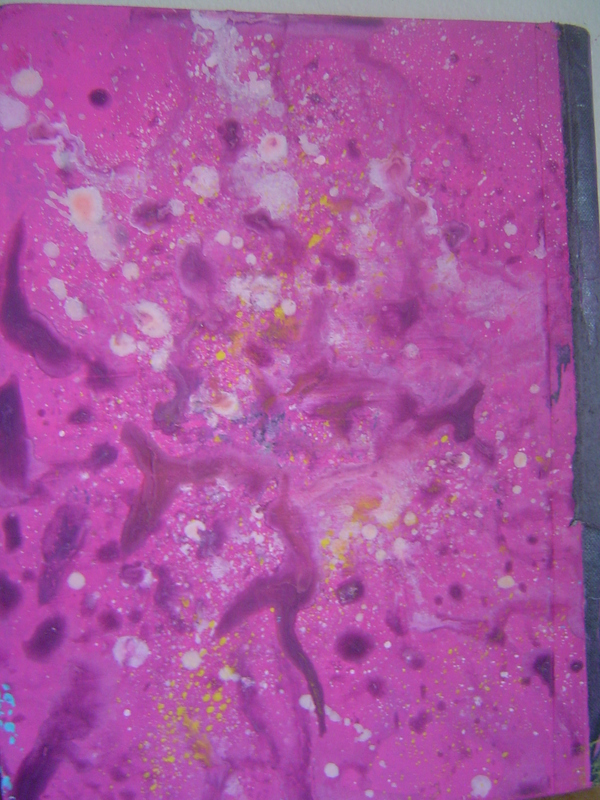 I use a sponge and toothbrush with water to give it a water effect. At first, I got frustrate that I put too much water in the color but I was able to get around it and use it to my advantage. 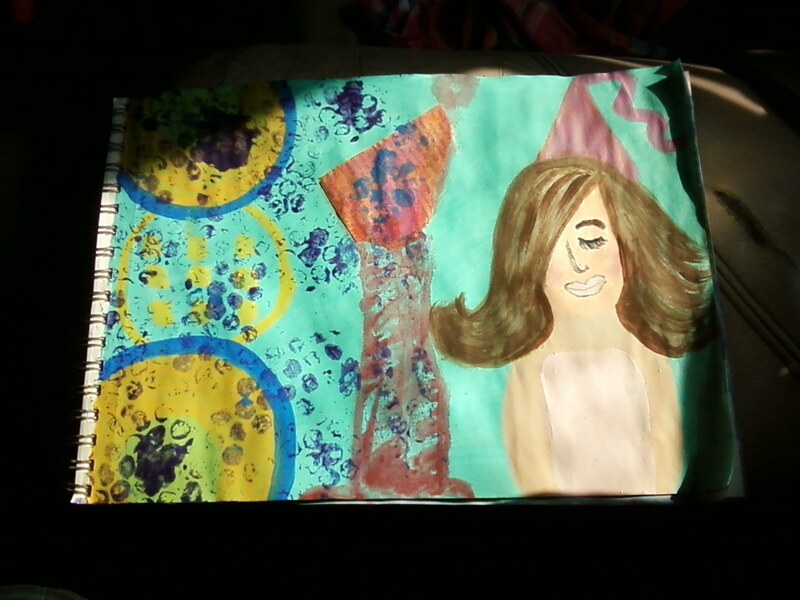 I had to use a fan to dry it off since I can be impatience with the process or I can just mess it up. If you look closer you can see the black and white notebook where the colors look lightly on. 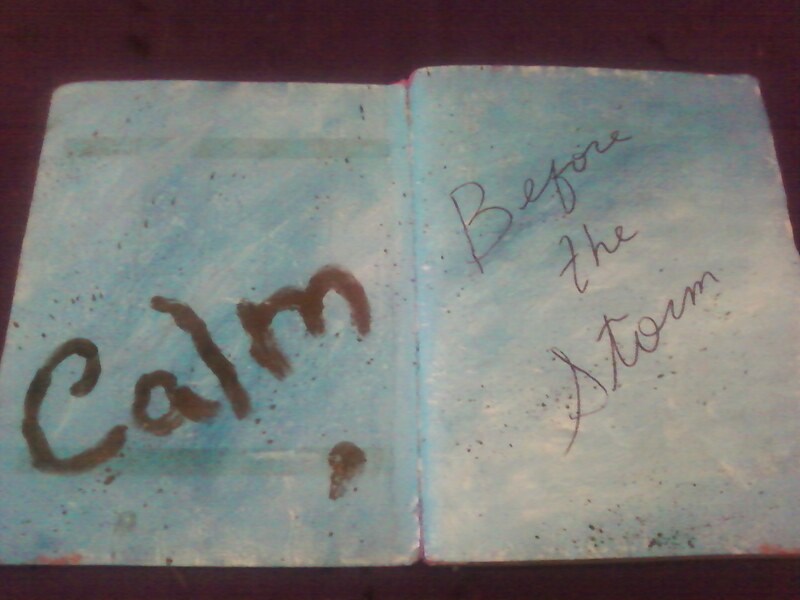 I wanted to make art journal entry and being new to it really takes a lot of patience in make them. 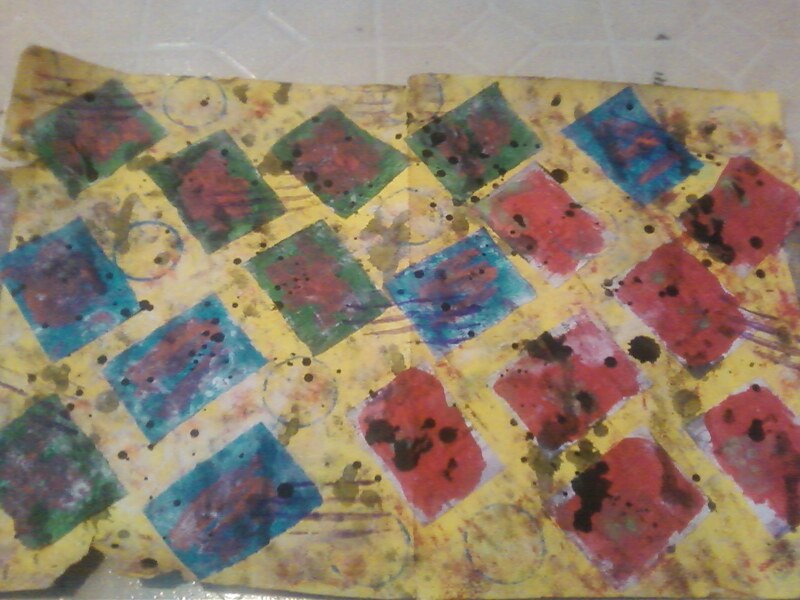 You have to use thick paper, little color, and waiting for it to dry. Then write what you want like what was on your mind that day or how you feel. It really helps when you want to get something off your chest. 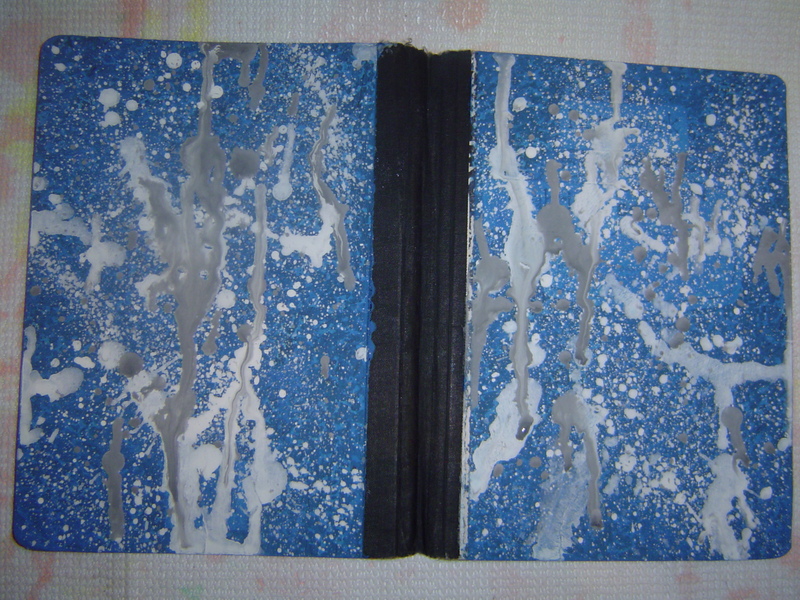 I grab one of the old notebooks and glue two pages together. 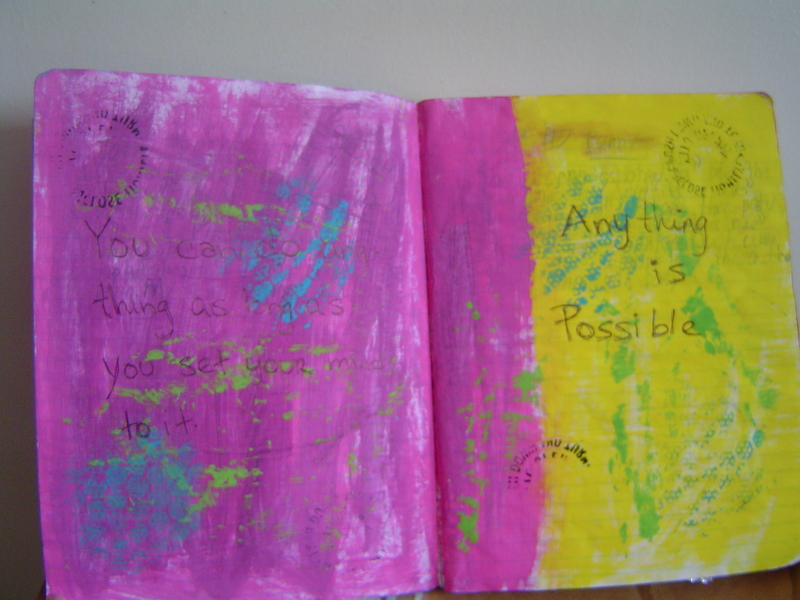 Then I paint in two pages and I wrote two quote that I feel everyone should live by. 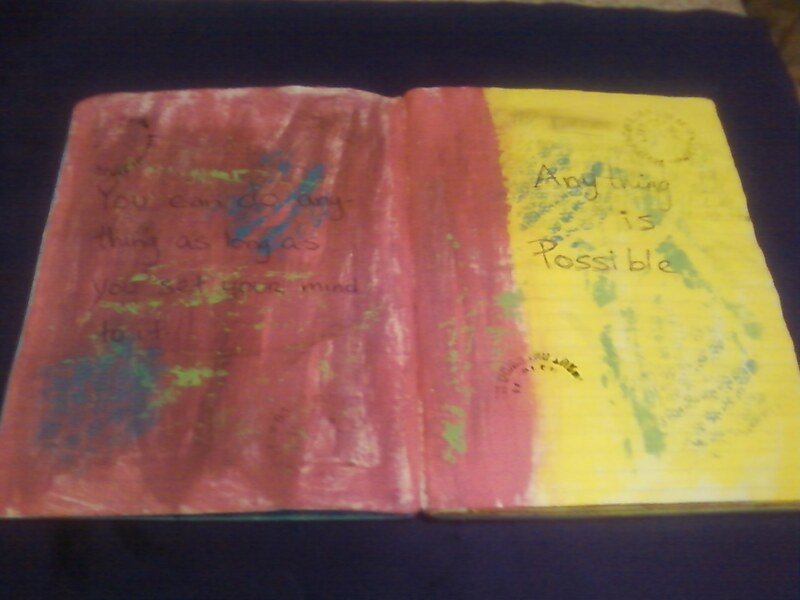 It reads, “You can do anything as long as you set your mind to it.” and “Anything is Possible.” Encouraging words I need on those days I dream and wonder if it can happen. 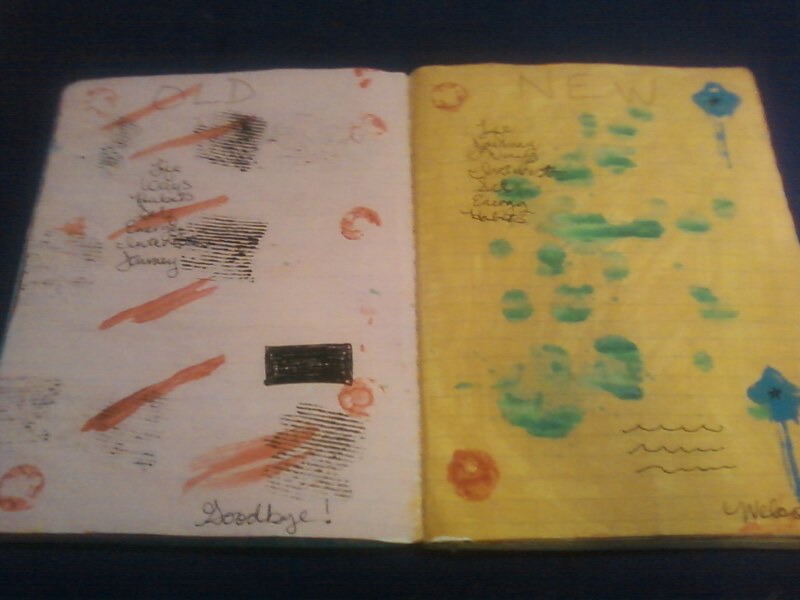 I am still using the notebooks that I found in my art. The notebook cover came off and I just decide to use both sides. 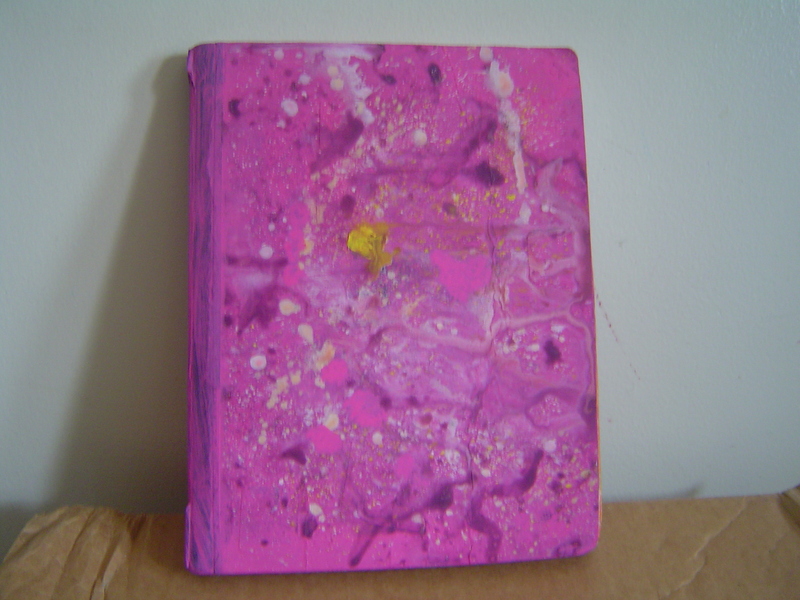 It made me want to do this to my own journal cover that I write in. It came out nice and colorful. Unfortunately. since it came loose, I don’t know where to put it. 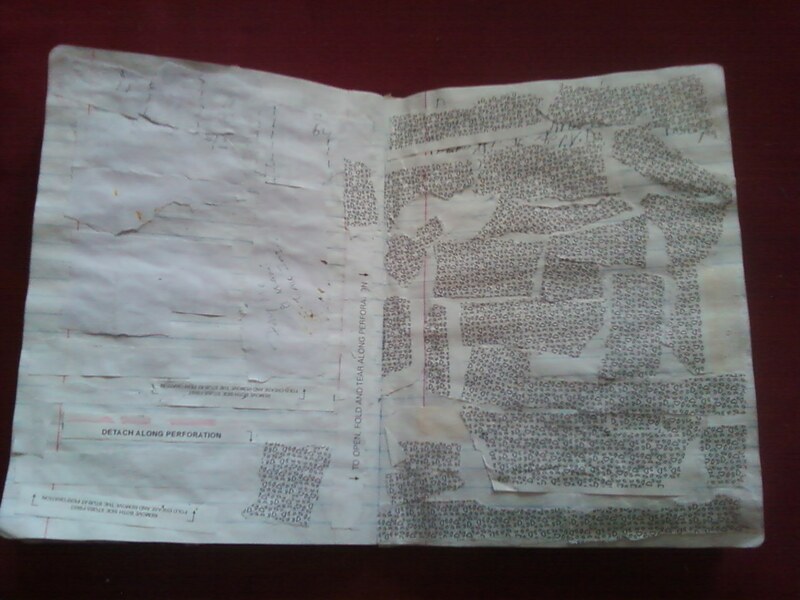 Maybe I can glue it in another notebook that has blank pages or make a journal book. I am exciting because it was all spontaneous. 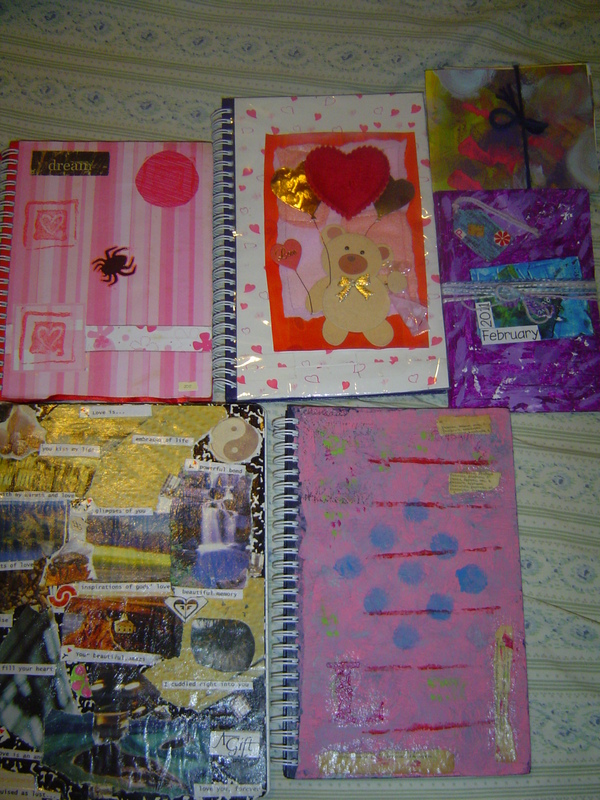 I just realize last year that I have quite a collection of journals. 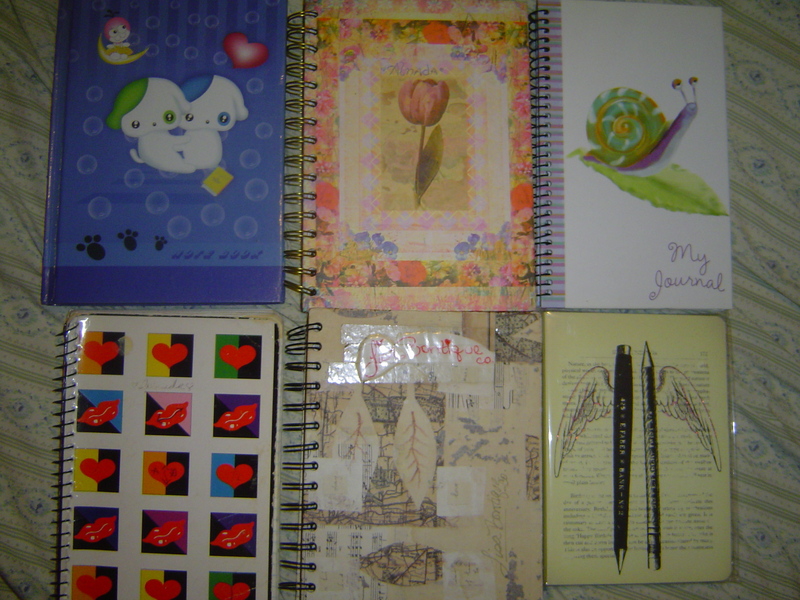 I started with black and white notebooks to spiral 3 subject notebooks. Then I went with buying beautiful journal book with beautiful design. And finally I started to decorate a few myself. This pop in mind this week because I’ve been encouraging myself for two years to writing as much as possible. One of my journal book is one quarter left. I was sad I have been writing so much lately that I try to use a second one when I just want to doodling and write random things. Then today I was thinking in search for a new one and remember that I have quite a collection of journals that have not been used and others that are half way finished. I just can’t help myself. I love to collected them and now I have some cool ideas to decorate them. I’m so tempted to get a few more to play around with the cover. Oh, wait there is still the others ones I brought last year. Where did I put those?